I am a confessed audiobook addict ever since many years ago when I decided to listen to a book on tape while wrapping Christmas gifts. Much as I had wanted to love Maeve Binchy’s books after friends had raved about them, I had been unable to get into them. But when I heard Tara Road read with brogue, I fell in love with Binchy’s story telling and went on to listen to every one of her books. I can still hear the words from Pat Conroy’s Prince of Tides read by Frank Muller, “Do it again, Mama.” Muller’s narration is celebrated by Conroy in a comment on Audible where he says about Muller, “He gave me, Pat Conroy, the author, a work of art, and I’ve been grateful ever since.”I’ve been hooked on audiobooks ever since. I used to listen while I was driving home from teaching in the evening and would be so involved in the book I was listening to, my husband would come out to the car to tell me to come in. Now that I can sync audiobooks with written books, I’m in heaven and spend less time in the driveway. 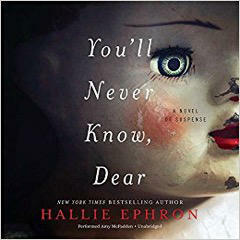 This week I am listening to Hallie Ephron’s latest suspense novel, You’ll Never Know Dear, which is narrated by Amy McFadden. Here’s a description of the plot from Amazon: Seven-year-old Lissie Woodham and her four-year-old sister Janey were playing with their porcelain dolls in the front yard when an adorable puppy scampered by. Eager to pet the pretty dog, Lissie chased after the pup as it ran down the street. When she returned to the yard, Janey’s precious doll was gone . . . and so was Janey. Forty years after Janey went missing, Lis—now a mother with a college-age daughter of her own—still blames herself for what happened. Every year on the anniversary of her sister’s disappearance, their mother, Miss Sorrel, places a classified ad in the local paper with a picture of the toy Janey had with her that day—a one-of-a-kind porcelain doll—offering a generous cash reward for its return. For years, there’s been no response. But this year, the doll came home. Already an Audiofile Earphones Winner, the book grabbed me right away. (Their review called it a “must-listen.” http://www.audiofilemagazine.com/reviews/read/128893/) Unlike in many mysteries where there is predictably a dead body on the first page, Ephron seduces you with suspense, luring you with ordinary events that you know won’t last because something terrible has happened and something even worse is on it’s way. McFadden’s narration conveys a sense of foreboding without overdramatizing. Ephron and McFadden are a powerful duo, complimenting one another, unlike some books where it sounds like the narrator is competing with the author. 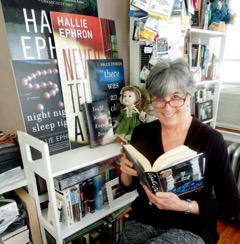 I wondered what Hallie thought about listening to someone else read her novel of suspense. “It’s scary listening to someone else read your book because, of course, it’s never the same as the voice you heard in your head when you were writing it. Our narrator, Amy McFadden, did a superb job. Her voice is clear as a bell, and she captured the characters perfectly including their southern accents and edge. I was thrilled.”She should be. The book is terrific with a solid plot and intriguing characters in its own right. Add to it the power of narration and you can’t miss. For me, You’ll Never Know Dear will fill hours while I am driving, walking, doing dishes and laundry, all the while in another world. Here’s a link to an excerpt (the first 5 minutes) from the audio book… https://soundcloud.com/harperaudio_us/youll-never-know-dear-by-hallie-ephron?in=harperaudio_us/sets/williammorrowbooks, if you’d like to join me.